The boat charter BVI inquiries at Nicholson Yacht Charters & Services are pouring in and we do our best to serve all customers in planning their perfect getaway for BVI yacht charters. Charter yachts in the Caribbean, we have the perfect yachts for small to big groups of people who would like to sail together and visit our exotic islands. Various requests for boat charter BVI vacations include great chefs and crew on their boats – this shouldn’t even be a problem with Nicholson Yacht Charters and Services because we only get you the best chefs, captains and crews for a 5-star experience on our BVI yacht charters. You can expect only but the best boats, equipment, sports gear and interiors when you choose Nicholson Yacht Charters and Services for your next Caribbean tour. There are many fascinating things to do in the British Virgin Islands. You can get up early in the morning to catch the sun rise while you dine with your friends or loved ones in the comfortable cockpit of your boat. Any special arrangements you desire will be set up by the boat crew. The chefs onboard make only the most scrumptious meals. You’re guaranteed to feel like you’re dining in an expensive hotel restaurant while you sail away. The crystal clear waters of the British Virgin Islands are regarded as one of the clearest in the world. You can’t get enough of the perfect temperature and the feel of the salty air on your skin. Let your hair down and allow nature to soothe your senses as waves lap at the side of your yacht. Feel the thrill of summer as you enjoy the sun, sea and air that are perfect in the Caribbean tropics. Many of our clients ask us how long should be a vacation in the BVI in order to fully enjoy the area. We recommend that the minimum would be a week so that you can visit all of the islands and tourist spots in the area. This timeframe also allows you to enjoy different activities that would also consume some time during your sailing experience. The Caribbean, being one of the top tourist destinations in the world, is also populated with different establishments that make tourists feel that they’re not too far away from civilization. Some islands have malls and high end shops or boutiques so that you won’t have to worry about forgetting to buy a gift for that very special occasion. You won’t worry about being pampered and relaxed too. For foodies who would like to try exotic dishes found only in the islands of the Caribbean, you’re in for an awesome time. Different islands offer the best dishes and the best hotels should you wish to stay longer in a particular place. Everything about the Caribbean is inviting, full of adventure and fun. You won’t regret making this fun charter with your friends, family or colleagues. 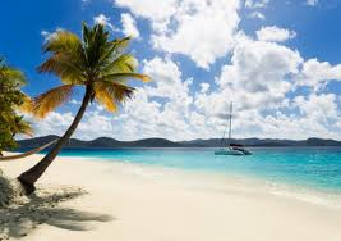 Make Nicholson Yacht Charters and Services be a part of your boat charter BVI experience!